How To Control Diabetes With Your Body, Mind And Spirit? A philosophy exists that it is important to practice total balance; body, mind and spirit to control diabetes. This is a path that is prevalent in Eastern traditions – Buddhism, Taoism and Chinese medicine. The secret behind these centuries-old traditions is that in order to be complete, or to maintain positive flow, one must integrate a perfect balance between these three main facets of human existence. How do these ancient traditions play a role with the improvement of life as they pertain to an ancient disease? How can Westerners learn from the philosophies of the East? The body is a temple, housing the mind and the soul. If there is a problem with the body, then both of the other two facets of the triangle suffer, too. It creates an imbalance. Respecting the body is a lesson that many people who suffer from diabetes may want to learn, especially if weight is an issue. It means structuring a diet that works with the condition, rather than against it. It means being proactive in reducing the unnecessary weight that may have caused the onset of diabetes in the first place. It also includes getting the proper amount of sleep and rest when necessary. 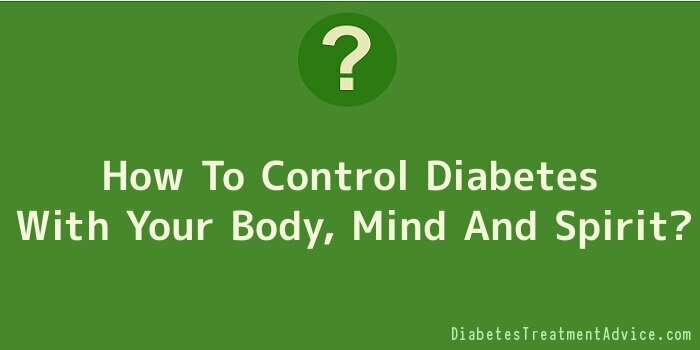 When it comes to body, mind and spirit to control diabetes, the mind is the control centre. It is the decision maker that guides the other two facets. It is in charge of maintaining the discipline to regulate the disease-this means making choices with diet (in accordance to when to eat and what to eat), maintaining a sound plan to shed the weight (if obesity is a factor) through exercise and to monitor blood glucose levels and adjust accordingly. When the mind is not sound, making the decision to effectively monitor the disease, then it is obvious that the other two areas will suffer. With the triangle, body, mind and spirit to control diabetes, the spirit may be considered the backbone of the three. In Western religion, spirit is often considered to relate to a holy presence. In Eastern religions, spirit is the embodiment of life or anything relating to life. Relating to diabetes, it is the instinct to preserve life. Therefore, it is the underlying guiding factor to take the necessary steps to preserve health. If the spirit is weak, then depression may set in. In turn, this will carry into all other aspects of maintaining a strong regimen to counter the disease. Diabetes can create complications in many aspects of life. Aside from the primary condition of the body either not producing enough insulin or failure to produce any insulin at all (which creates complications in the passing of glucose into the cells), hypertension (high blood pressure), numbness (caused by lack of circulation to the appendages), fatigue and/or drowsiness, fatty tissue in the blood stream (ketones) and cardiovascular problems (due to hardening of the arteries). Aside from these issues, individuals who have diabetes for a long period of time (twenty years) are at risk for retinopathy. Retinopathy is a micro-vascular complication that affects those with diabetes. What it means is that people who have the disease (for a prolonged period of time) are at a greater risk of going blind (up to twenty five more times likely). This can be prevented with regulated control of insulin and proper care in relation to weight and diet. Body, mind and spirit to control diabetes are combining Eastern philosophy with patient care. It is a logical means of living a complete and healthy life with the disease.